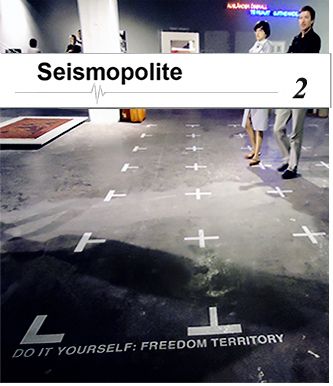 Seismopolite Journal of Art and Politics - Reimagining The Political Geography Of Place And Space :: Call for Papers - Deadline: March 5, 2012. The self-fulfilling prophesy of neoliberal geography also constitutes an effective impasse in alternative visions of political geography –- on the one hand, by making the critical reconstruction of place and its interconnectedness with a larger picture, beyond the dichotomies of space/place and local/global, superfluous -– on the other, by dissimulating any locally based meaning of universality that cannot be reduced to the civilizing prospects and ideals of neoliberal universalist geography. In this sense, the self-upholding myth of the local which neoliberal geography feeds on seems to express another form of orientalism, convincingly presenting itself and its worldview as the necessary cure to global and local problems, and reversely; presenting political issues in localities beyond its borders as a temporary void in its over-arching, inescapable logic. The concepts of space and place in art, and their renegotiation through art. The relationship between neoliberal political geography and orientalism. The art biennial as a global phenomenon, and its role in the (re)negotiation of political geography. The relationship between art and geography. The Second International Conference on Transdisciplinary Imaging at the Intersections between Art, Science and Culture :: June 22-23, 2012 :: Victorian College of the Arts, Federation Hall, Grant Street, Southbank, Melbourne 3006 :: Call for Papers: Interference Strategies for Art - Deadline for Abstracts: March 30, 2012. The Transdisciplinary Imaging Conference seeks papers that explore the theme of ‘Interference’ within practices of contemporary image making. Today we’re saturated with images from all disciplines, whether it’s the creation of ‘beautiful visualisations’ for science, the torrent of images uploaded to social media services like Flickr, or the billions of queries made to vast visual data archives such as Google Images. These machinic interpretations of the visual and sensorial experience of the world are producing a new spectacle of media pollution. Machines are in many ways the new artists. 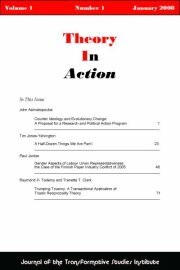 Are contemporary forms and strategies of interference the same as historical ones? What kinds of similarities and differences exist? The conference will explore areas related to: Painting, Drawing, Media Art, Film, Video, Photography, Computer visualization, Real-time imaging, Intelligent systems, Image Science. You are invited to submit an abstract for an individual paper relevant to the conference theme as described above. The deadline for abstracts is March, 2012. Abstracts for individual papers should be no longer than 250 words. Please provide full contact details with your abstract. Refereeing of papers will be done by members of an expert review panel (to Australian DEST refereed conference paper standards). All selected peer reviewed papers will be published in the online conference proceedings. March 30th deadline call for abstracts; April 30th delegates peer reviewed abstracts notified; June 22- 23 Final papers for conference 3000 words. National Institute of Experimental Art, College of Fine Art, University of New South Wales; Victorian College of Art, University of Melbourne,. Australian National University, Curtin University, Deakin University; Monash University; Queensland College of Art, Gold Coast Griffith University; Queensland University of Technology, RMIT University, Swinburne University; University of Sydney, Sydney College of the Arts, University of Technology Sydney, University of Wollongong. Albion A.R. Art Walk :: April 22 - May 17, 2012 :: Reiger and Victory Parks - Albion, Michigan :: Call for Submissions — Deadline: February 11. Up to 20 works of art will chosen from around the world for this inaugural year of the Albion A.R. Art Walk. Albion College and the Virtual Public Art Project (VPAP) will launch a series of site-specific virtual artworks throughout the city of Albion to be viewed via VPAP’s free Layar App for most iPhone and Android smartphone devices. Artists and designers interested in submitting work for this project should refer to the guidelines listed below. Embroidered Digital Commons Workshops with Ele Carpenter and Emilie Giles :: Saturdays, March 3 - April 28, 2012 (excluding April 7); 10:00 - 12:00 pm :: Furtherfield Gallery, McKenzie Pavilion, Finsbury Park, London. 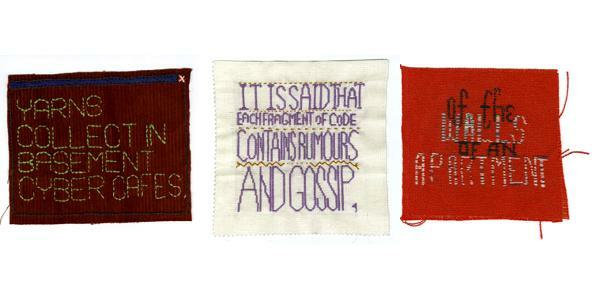 The Embroidered Digital Commons is a collectively stitched version of A Concise Lexicon of/for the Digital Commons by the Raqs Media Collective (2003). The project seeks to hand-embroider the whole lexicon, term by term, through workshops and events as a practical way of close-reading and discussing the text and its current meaning. Would you like to stitch the Digital Commons with us? chosen in relation to the theme Being Social. 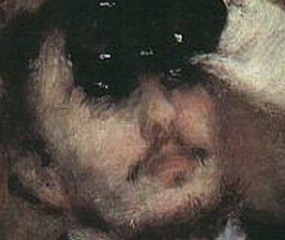 A cultural ‘meme’ is the way in which an idea spreads through social networks. We are inviting crafters, programmers, artists, makers, and people interested in working collaboratively, or taking part in participatory projects to each stitch a few words of the term meme, as described below. The resulting patches will then be turned into a short film depicting the sequence of embroideries. In 2003 the Raqs Media Collective wrote A Concise Lexicon of/for the Digital Commons. The full lexicon is an A-Z of the interrelationship between social, digital and material space. It weaves together an evolving language of the commons that is both poetic and informative. The terms of the lexicon are: Access, Bandwidth, Code, Data, Ensemble, Fractal, Gift, Heterogeneous, Iteration, Kernal, Liminal, Meme, Nodes, Orbit, Portability, Quotidian, Rescension, Site, Tools, Ubiquity, Vector, Web, Xenophilly, Yarn, and Zone. The concept of the digital commons is based on the potential for everything that is digital to be common to all. Like common grazing land, this can mean commonly owned, commonly accessed or commonly available. But all of these blurred positions of status and ownership have complex repercussions in the field of intellectual property and copyright. The commons has become synonymous with digital media through the discourse surrounding free and open source software and creative commons licensing. The digital commons is a response to the inherent ‘copy n paste’ reproducibility of digital data, and the cultural forms that they support. Instead of trying to restrict access, the digital commons invite open participation in the production of ideas and culture. Where culture is not something you buy, but something you do. The embroidery is a slow reproduction of A Concise Lexicon of/for the Digital Commons text, transmitting the meme of the lexicon to hundreds of people stitching across the globe. In this way the work is a cultural meme, transmitting ideas through thinking and making as part of a distributed participatory project. The whole text is easy to take apart, divide into small sections, stitch, and reassemble through fabric and film. It is easy to translate into different formats, but hard to translate metaphor into different languages. The poetic and metaphorical aspects of the digital commons are recontextualised through close-reading, close-listening, discussion and shared making. The ideas are most effectively explored when they are expressed and illustrated using and multiple layers of meaning and wit. The meme of the digital commons travels fast through networks that investigate the language of shared production and distribution, for example crafters and open source programmers are committed embroiderers of the digital commons. The meme of the digital commons has also spread across all areas of cultural production including music, design and art. Ele Carpenter is a curator based in London. Her creative and curatorial practice investigates specific socio-political cultural contexts in collaboration with artists, makers, amateurs and experts. She is a lecturer in Curating at Goldsmiths College, University of London. Since 2005 Ele has facilitated the Open Source Embroidery project using embroidery and code as a tool to investigate the language and ethics of participatory production and distribution. The Open Source Embroidery exhibition (Furtherfield, 2008; BildMuseet Umeå Sweden, 2009; Museum of Craft and Folk Art, San Francisco, 2010) presented work by over 30 artists, including the finished Html Patchwork now on display at the National Museum of Computing at Bletchley Park. Ele is currently facilitating the ‘Embroidered Digital Commons’ a distributed embroidery exploring collective work and ownership 2008 – 2013. 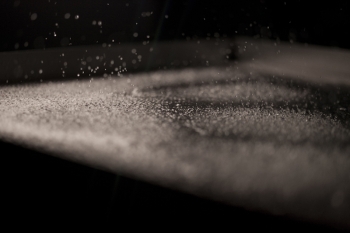 Emilie Giles is an alumnus of MA Interactive Media: Critical Theory and Practice at Goldsmiths College. Since graduating in 2010 her time has been spent co-organising MzTEK, a women’s technology and arts collective, as well as completing an internship with arts group Blast Theory and working for social video distributors Unruly. She is currently involved with TESTIMONIES, a project which explores oral history in relation to the 2012 Olympic and Paralympic Games largely through social media. Emilie’s own practice revolves around notions of pervasive gaming, married with urban exploration and psychogeography. Her most recent focus lies in taking fundamental gaming principles from Geocaching and exploring the consequences of adding an emotional dimension. Raqs Media Collective, 2003, A Concise Lexicon of/for the Digital Commons. In: Sarai Reader 03: Shaping Technologies, ed. Monica Narula, Shuddhabrata Sengupta, Jeebesh Bagchi, Ravi Vasudevan, Ravi Sundaram + Geert Lovink, Sarai-CSDS Delhi/WAAG Amsterdam, 2003. p365. Available here. During the 2012 – 2013 academic year, Terminal will award four – $500 stipends to assist in the creation of new internet based art works. The submission deadline is February 15, 2012. Terminal can provide webspace for completed projects, or the artists may elect to host the project themselves (with Terminal retaining a copy for archiving). We simply ask that Terminal be acknowledged with a link from the project. xtine burrough is a media artist and educator. She is the editor of Net Works: Case Studies in Web Art and Design (Routledge 2011) and co-author of Digital Foundations (New Riders/AIGA 2009). Informed by the history of conceptual art, she uses social networking, databases, search engines, blogs, and applications in combination with popular sites like Facebook, YouTube, or Mechanical Turk, to create web communities promoting interpretation and autonomy. xtine believes art shapes social experiences by mediating consumer culture with rebellious practices. As an associate professor of communication at CSUF, she bridges the gap between histories, theories, and production in design and new media education. Stephanie Rothenberg creates provocative interactions that question the boundaries and social constructs of manufactured desires. Through participatory performance, installation and networked media, her work investigates the mediation of the physical, analog body through the digital interfaces of commodity culture. Adopting the role of cultural anthropologist, the medium of the techno-sphere itself becomes a laboratory for raising critical questions about our interpersonal relationship to technology and its broader socio-political implications. Stephanie has exhibited, performed and lectured in the US and internationally at venues including the Sundance Film Festival, MASS MoCA, Whitney Museum of American Art, Banff New Media Institute and LABoral Center for Art & Industry. She has received numerous awards including a 2011 Harpo and a 2009 Creative Capital in Emerging Fields. She has been in residence at art & technology centers such as Eyebeam, Harvestworks and free103point9 Wave Farm in upstate NY. In addition to her position as Associate Professor in the Department of Visual Studies at SUNY Buffalo, Stephanie is Artistic Co-Director of REV-, a non-profit organization based in New York City, that furthers socially-engaged art, design, and pedagogy. 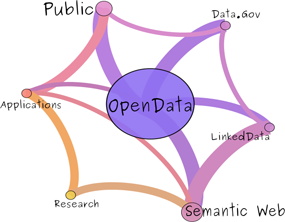 Workshop on Open Data in a Semantic Web Perspective :: May 27, 2012 :: York University, Toronto, Ontario, Canada (co-located with Canadia AI 2012) :: Call for Papers: Deadline - February 22, 2012. Touch and Go, Leonardo Electronic Almanac :: Call for Papers - Deadline: February 12, 2012. The Watermans’ International Festival of Digital Art, 2012, will coincide with the Olympics and Paralympics in London, and Watermans is pleased to host a Festival of ground-breaking installations exploring interactivity and participation in New Media and Digital Art. This year long project is showcasing the work of six international artists and collectives and initiates discussions around the impact of technology in art as well as the meaning, possibilities and issues around human interaction and engagement inviting responses from artists, academics, students, art professionals and the public. The project will include a series of seminars in collaboration with Goldsmiths, University of London and a publication with the Leonardo Electronic Almanac. This special issue of LEA wishes to analyze the relationship between these different aspects that contribute to the complexity – conceptual, technological and aesthetic – of interactive installation in public space, creating the ground-breaking and complex phenomena that characterize the aesthetics and visuality of contemporary technocultures. The Leonardo Electronic Almanac (LEA) is inviting proposals for an issue on these or related themes with Senior Editors Lanfranco Aceti (Kasa Gallery Director and LEA Editor in Chief) and Janis Jefferies (Goldsmiths College). The issue guest editors are Irini Papadimitriou and Jonathan Munro. New Media academics, theoreticians, curators, art historians and artists that are interested in any combination of the above themes are particularly welcome to submit proposals for consideration. The Ends of Audience: Interdisciplinary Workshop :: May 30-31, 2012 :: Queen Mary University of London :: Call for Proposals - Deadline: January 31; Midnight GMT. People in audiences act: they talk, clap, heckle, sigh, inhale, exhale, rustle, twitch, tweet, dance, flirt, laugh, whisper, shuffle, cough… in doing so, they interact. There is a structure and dynamic to these responses which is central to the experience of being in a live audience. This workshop aims to bring together researchers and professionals with interests in performance, interaction and technology who are working on understanding, instrumenting or experimenting with these dynamics, and the shifting ends of audience that they reveal. - technologies and methods for enhancing and manipulating audience engagement. 319 Scholes presents Art Hack Day :: January 26-28, 2012 :: 319 Scholes Street, Brooklyn, NY. Art Hack Day is an event dedicated to cracking open the process of art making, with special reverence toward open-source technologies. Between January 26-28, artists and collaborators will inhabit 319 Scholes to create and explore the participatory nature of technology, bringing together hackers whose medium is art and artists whose medium is technology. The event will be streamed to online audiences, who will be encouraged to participate through various platforms to be listed on the ArtHackDay.net website. Visitors are invited to engage and interact with the projects online throughout the hack, as well as join the teams on Saturday night starting at 7:00 pm for a closing exhibition, live performances, and a massive party. Confirmed participants include: Slava Balasanov, Paul Christophe, Hethre Contant, Alejandro Miguel Justino Crawford, James George, Lara Grant, Ted Hayes, Mary Huang, Nova Jiang, Jeremiah Johnson, Josh Keay, Arkadiy Kukarkin, Leonhard Lass, Olof Mathé, Avery Max, Kyle McDonald, Sean McIntyre, Eric Mika, Cullen Miller, Kristen Mukai, Reed & Rader, David Stolarsky, Olov Sundström, Jonathan Vingiano, Eric Wahlforss, Dan Wilcox, Chris Woebken, Andrea Wolf, Sofy Yuditskaya, Tamar Ziv, + many more to come! 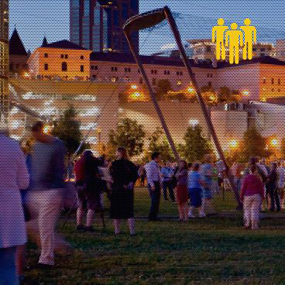 Northern Spark: presenting innovative art in the public sphere. Calling All Artists: Northern Lights is happy to announce a number of calls for participation in the 2012 edition of Northern Spark, which will take place June 9-10, 2012. For some background on this year’s Northern Spark see here. The new website will launch later this week at northernspark.org. Call for 10 projects in any media/discipline: We are looking for projects that are sited/ performed in public space and engage a broad public audience in that space. Projects can be in any medium or discipline. Look at the project line up for Northern Spark in 2011 to see the wide range of works presented. Application deadline: February 27. The call is here. Call for 2 projects in any media/discipline – inter/national: We are looking for projects that are sited/ performed in public space and engage a broad public audience in that space. Projects can be in any medium or discipline. This call is funded in part by the NEA and is for artists living or working outside of Minnesota. Application deadline: February 13. The call is here. Call for Data Visualization project: This is an open call in collaboration with The Eyeo Festival for a data visualization project. Application deadline: February 13, 2012. The call is here. Call for Minnesota Center for Books Arts project: Minnesota Center for Book Arts (MCBA), in collaboration with Northern Lights.mn, is accepting proposals for an all-night event in MCBA’s gallery and studio space as part of Northern Spark. Application deadline: January 30. The call is here. More Calls: More calls will be announced in the coming days. Subscribe to the Northern Lights mailing list, Like us on Facebook, follow us @Northern_Spark or get the tumblr feed to stay informed. FILE - Electronic Language International Festival :: July-August 2012 :: Gallery of FIESP, Ruth Cardoso Cultural Center, São Paulo, Brazil :: Call for Art, Lectures, Workshops: Deadline - February 29, 2012. The workshop will begin with a brief discussion of dioramas with examples representing the breadth of the medium. The participants will be asked to imagine a context (fictional or not) which they will construct within a provided frame. The intention isn’t to represent the context literally but rather create a palpable atmosphere. 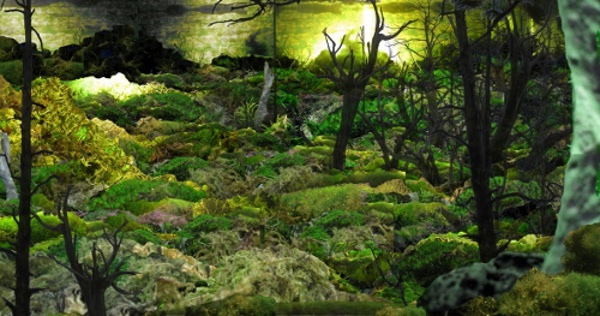 Throughout this workshop we will be introducing concepts and techniques to aid the participants in the development of their dioramas. These techniques will range from incorporation of lighting and viewing devices (peep holes, webcams, etc.) to working with intuition through lateral and associative thinking. No experience in design is necessary for this workshop so people at all levels of design experience are encouraged to join. All the necessary materials will be provided but participants are invited to bring magazines and materials that they would like to use/share. The workshop will be organized by Amy Jo Diaz, a Los Angeles based artist who has worked extensively in collage and Casey Hughes, a Los Angeles based architect who has a built, lit and photographed many-a-architectural model. Over the past 4 years Low Lives has developed a platform that invites and enables artists, audiences, and presenting venues to “plug in and participate” from anywhere an internet connection exists. This technological platform brings a history of supporting artists’ full creative freedom to imagine new worlds and is now offered to artists interested to present work in solidarity with #OWS. Online documentation of the live event will allow Low Lives: Occupy! 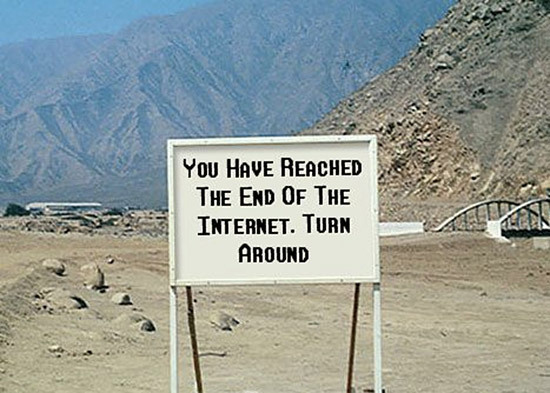 to inspire online audiences far into the future. Email complete materials to lowlivesoccupy [at] gmail.com with Low Lives: Occupy! in the subject line. Incomplete applications will not be considered. 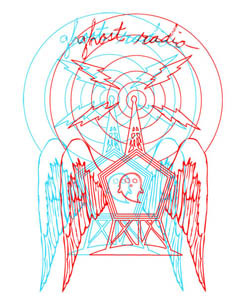 Selected artists/ individuals/ groups will be given instructions and guidance on how to transmit their performance through a live online broadcasting network. Performances will be projected in real time across the Low Lives network of Presenting Partners and venues. 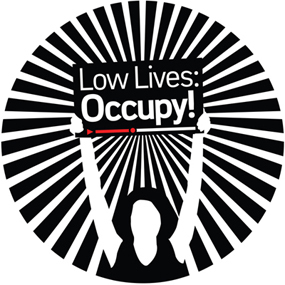 Anyone interested in co-presenting Low Lives: Occupy! please email: lowlivesoccupy [at] gmail.com with Low Lives: Occupy! Presenter in the subject line. The platform celebrates the transmission of ideas beyond geographical and cultural borders, and opens multicultural and intergenerational dialogue through visual language, new technologies, and contemporary expressions. Low Lives is about both the presentation and transmission of performative gestures from a particular place and time. Low Lives produces an annual Networked Performance Festival. Occupy With Art (Formerly Occupennial) is an affinity group of the Arts & Culture working group. We are artists, writers, curators, and art professionals lending our skills to produce art, cultural events and projects, with a particular focus on OWS itself as a social art process. We work with organizations and artists that require a focused team to facilitate their projects. We produce art projects, large-scale events, and exhibitions. Our website serves as an information hub for current and past art-related activities in the OWS movement. We are committed to building relationships within OWS and with outside arts organizations. The Hemispheric Institute of Performance and Politics is a collaborative, multilingual and interdisciplinary network of institutions, artists, scholars, and activists throughout the Americas. Working at the intersection of scholarship, artistic expression and politics, the organization explores embodied practice — performance — as a vehicle for the creation of new meaning and the transmission of cultural values, memory and identity. Anchored in its geographical focus on the Americas (thus “hemispheric”) and in three working languages (English, Spanish and Portuguese), the Institute’s goal is to promote vibrant interactions and collaborations at the level of scholarship, art practice and pedagogy among practitioners interested in the relationship between performance and politics in the hemisphere. Note- the annual Low Lives 4 Networked Performance Festival is scheduled for April 27-28, 2012. A separate call for proposals will be issued in late January 2012. *Low Lives: Occupy! logo designed for Low Lives by Juan Obando. Twin bombs of the first 40 bombs ordered will be part of a guerrilla art exhibition in March 2012. The venue could be: Devon Islands (Canada), Ōmiya Park Soccer Stadium (Japan) or the Guggenheim Museum in New York (USA). You, dear bomb hosts, decide which one or suggest other places. On the website you can find some exhibition visualizations, see which venue is currently on the top and order your bomb. Each participant can order five bombs maximum. But only one of them can take part in the exhibition. 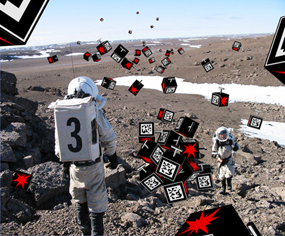 Augmented Bombings is an art project fighting virtual trash in the so called “Augmented Reality” by courageous 3D bombing. Responsible for the project is Susanne Berkenheger. Exhibition Visualization: Adaptation of the photo ‘Crew 3 members Charles Frankel and Brent Bos climb Marine Rock on Devon Island on July 20, 2001′ by The">[creativecommons.org] Mars Society, available under CC-BY-SA-3.0 Copyright © 2001 The Mars Society.